Tours of the Terminal Tower observation deck are not affiliated with Tours of Cleveland, LLC. Tickets for the observation deck must be purchased in advance and are timed. You can not purchase tickets at the door. Tickets can be purchased on www.eventbrite.com for just $5.00. Typically it is open on Saturdays and Sundays. The observation deck is on the 42nd floor of the tower and it offers 360 degree views of the city. It first opened back in 1928. From there, you can see Progressive Field, First Energy Stadium, Lake Erie, the Westside Market and get a great bird’s eye view of Public Square. I highly recommend a visit! 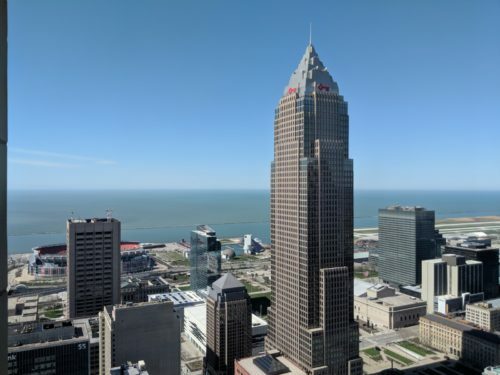 The observation deck tour is not sponsored or affiliated by Tours of Cleveland, LLC. Tours of Cleveland offers exciting and educational walking tours of beautiful and historic downtown Cleveland. To see our schedule and book your walking tour, visit https://toursofcleveland.com/book-tour/.